I know that there has been a lot of groaning about the weather on this blog lately due to the fact that I seriously dislike the summer. It’s all hot and sticky and I’ll all sweaty and cranky. It’s not my favorite season. But, I will grudgingly admit, summer has its perks. Ok, maybe just one- fresh produce! I am loving going to the farmers markets on the weekend and getting fresh fruits and vegetables. Even the grocery stores have more selection. I went into Whole Foods this weekend and the produce area was packed. It was like a Produce Utopia! I had to fight to stick to my very specific grocery list and not buy one of everything, which was really really hard! With that said, I’ve been eating a ton of salads. 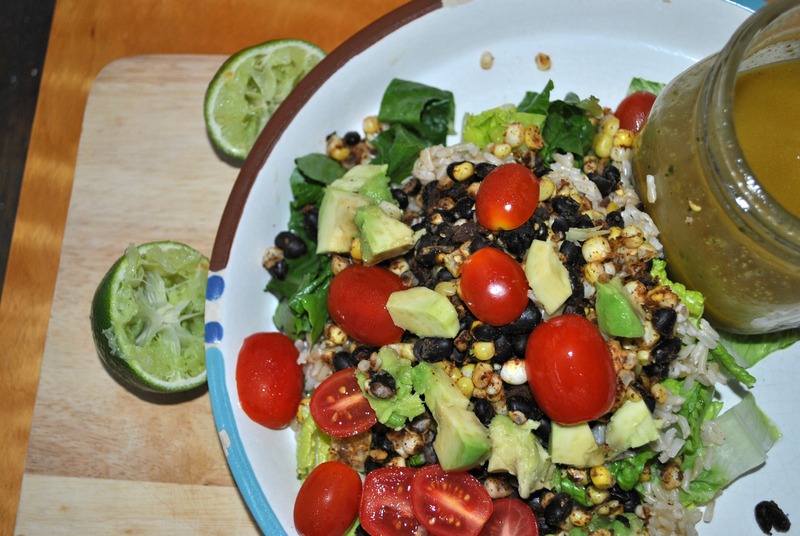 It’s so easy just to cut up a bunch of fresh fruits and veggies and dump them in a bowl. This means I’ve been seriously slacking in the hot meals area lately. The closest I come to my stove is to make a big pot of grains to get me through the week and then I avoid it like the plague. 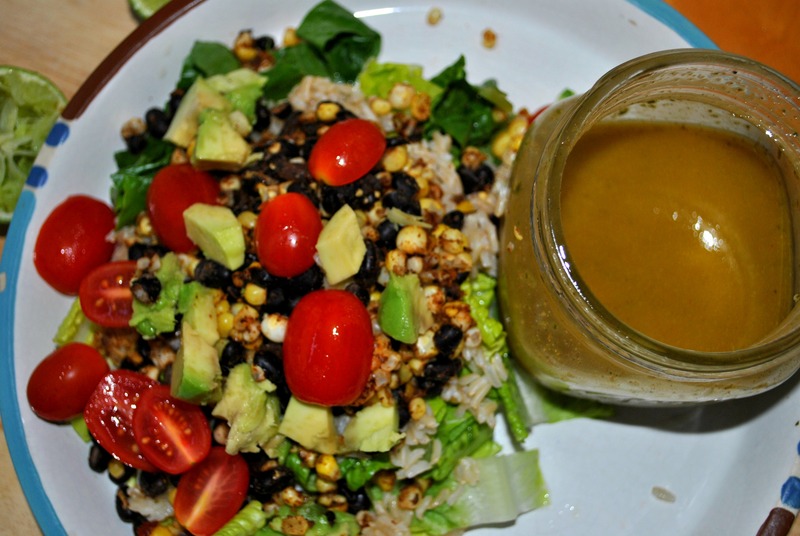 But last week, my new favorite blog, Rabbit Food For My Bunny Teeth, posted this recipe and I couldn’t get it out of my head. I don’t know why- It’s just a stir-fry. But I think its close enough to my “cut-produce-up-and-dump-in-bowl” theory that I was convinced I needed to make it. And I’m SO glad I did. It is insanely delicious. In a medium pan, combine the vegetable broth, soy sauce, and ginger together over medium heat. 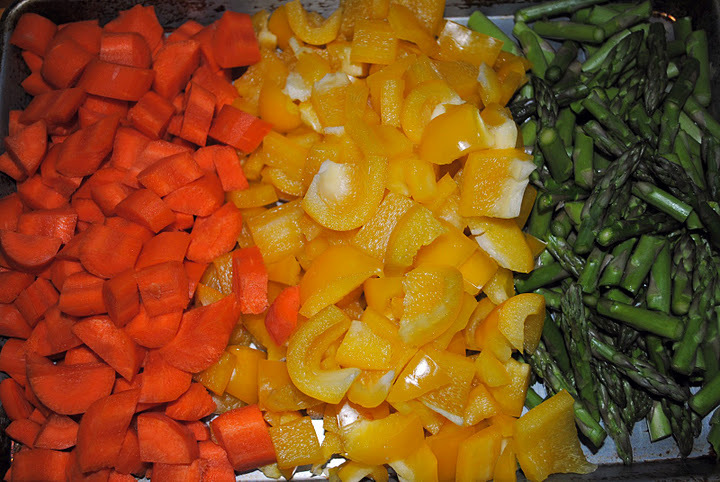 Add the bell pepper, onion, carrots, and the spinach. 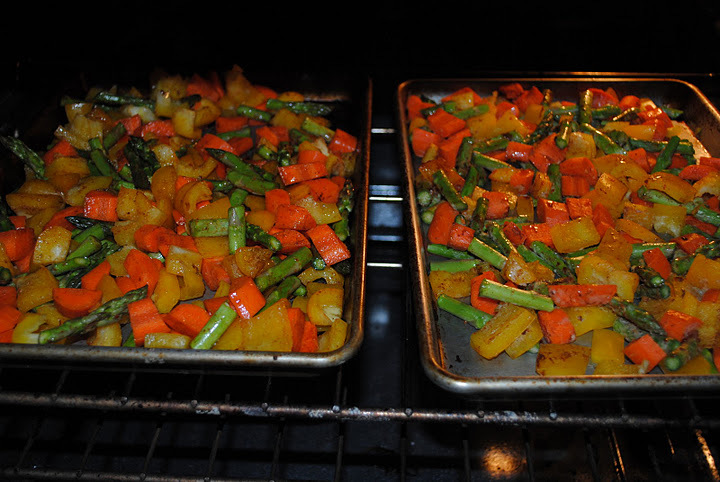 Cook the vegetables until they absorb most of the cooking liquid and become tender. 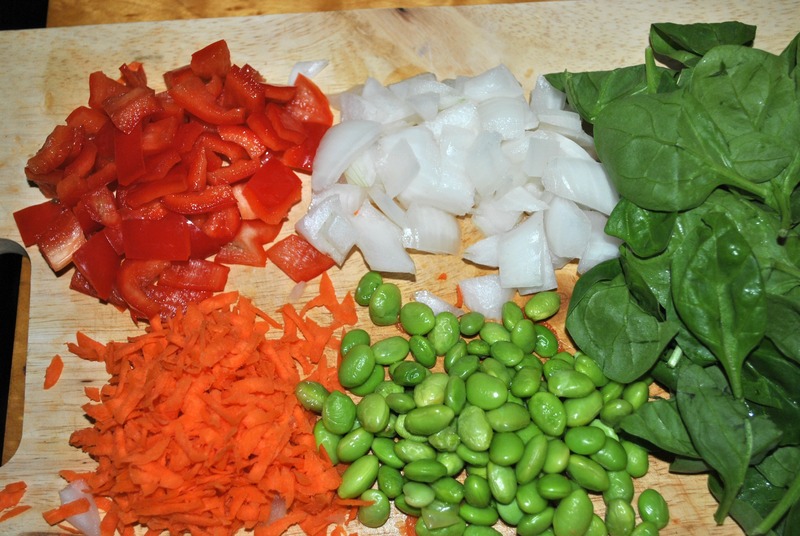 Add in the unshelled edamame and stir until cooked. 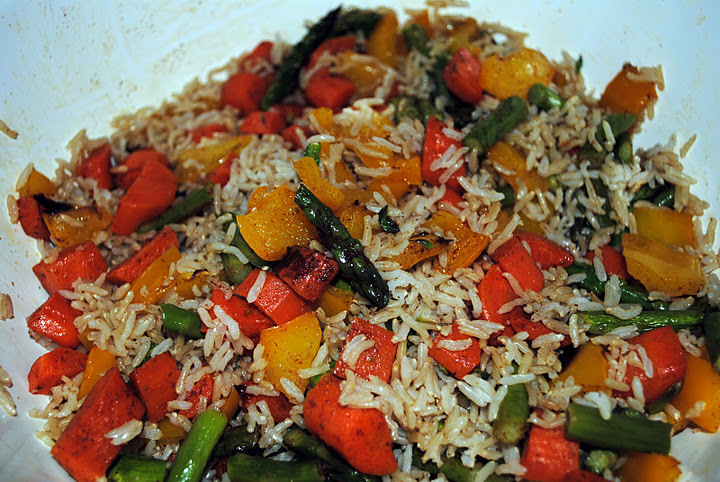 Add the cooked brown rice and gently mix into the vegetables. 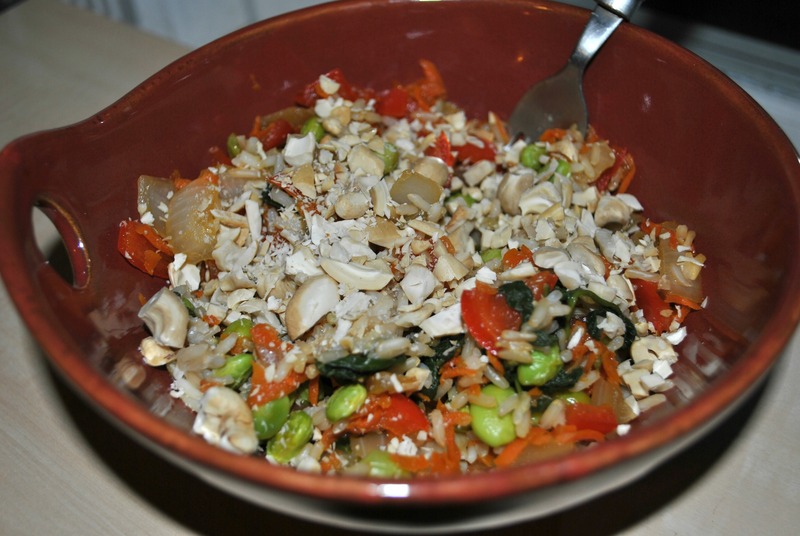 Top with chopped cashews. Serve hot. I can’t tell you why I love this recipe so much. Maybe it’s simply because I was craving something hot. 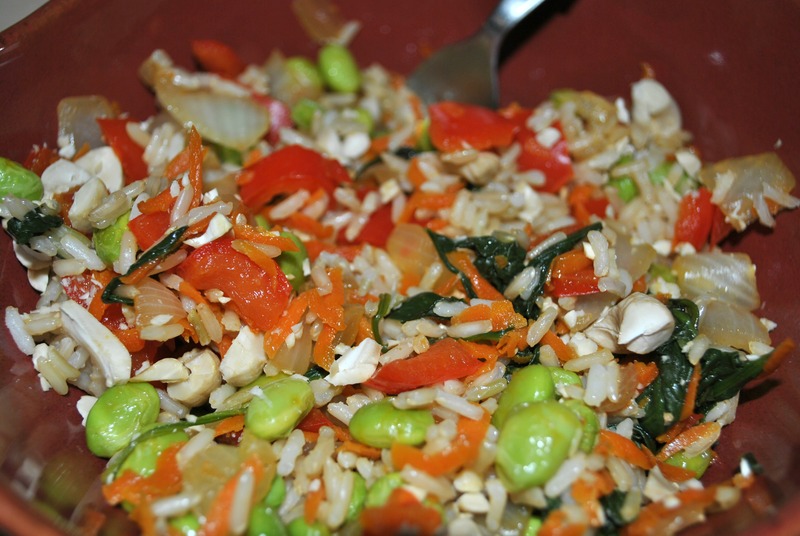 More likely though, this recipe just has the right mix of veggies. All the health articles I read say you should eat lots of different colored produce so your getting all sorts of nutrients and this recipe definitely has color! And if you haven’t checked out RFFMBT, yet, definitely do so. 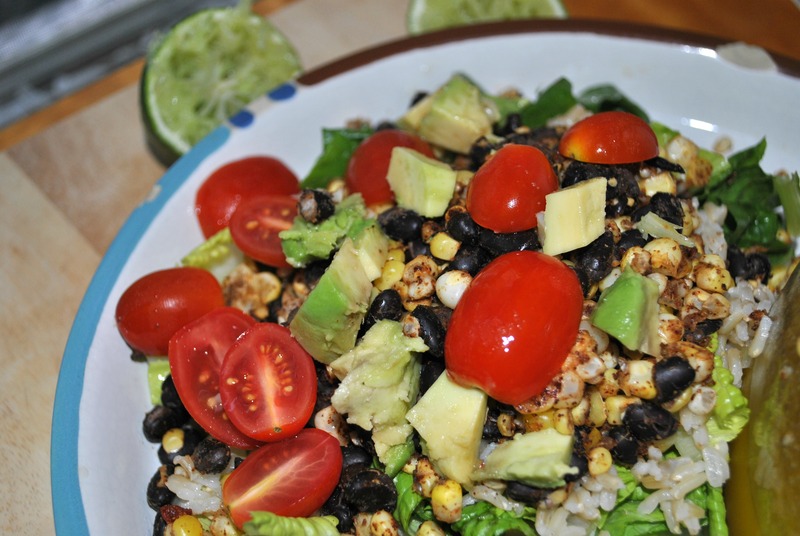 Catherine has a great story to share, yummy recipes and a revamped food pyramid that I love. She also has a section that shows what you should be eating for each meal and what 1 portion equals. For instance, one portion of quinoa is not a bowl full- it’s actually only 1/2 cup. Definitely good to know! Before I start, I just want to thank everyone who checked out Wicked Vegan for my St. Patty’s Day posts. I had a record high number of hits Thurs, Fri and Saturday, tripling what I normally get in an average day. I hope everyone enjoyed themselves and got to make some yummy St. Patty’s day food!! I’ve left the city behind for a week and have gone up north with some friends to the mountains. I had expected loads of snow and cold weather and lots of comfort food but, temperature-wise, it’s a record high up here and yesterday I went and sat in the sun for 2 hours. Of course, in true me fashion, everyone was in shorts and sandals and I was in boots, tights and a skirt. But, in my defense, I had packed for the mountains! Lots of hoodies and jeans and warm boots. Plus, my skirt had a floral print and my boots were suede ankle boots. It was practically spring gear! Anyway, this weather is making me really glad I didn’t spend a boatload on a plane ticket to FL. It’s the perfect weather for shopping (which I’ve done a lot of! ), not so good weather for holing up and scrapbooking/crafting (which was my plan). It’s also throwing of my very rough idea of what I was going to be making food-wise. Plus, I’m in a strangers kitchen, which isn’t stocked like mine, so recipes this week may be scarce. I’ve already gone to the local smokehouse once and I’m contemplating going again tonight (they have a super delicious vegan burger with homemade hummus and BBQ sauce. I’ve already bought a jar to take home with me…). I did manage to whip together this dish the first night I was here, when it was still cold, before I went grocery shopping and before I discovered where the smokehouse was so at least you’ll get one recipe this week! Cook your basmati rice according to the directions on the package (should take about 15-20 minutes). While your rice is cooking, heat olive oil in a medium size skillet. 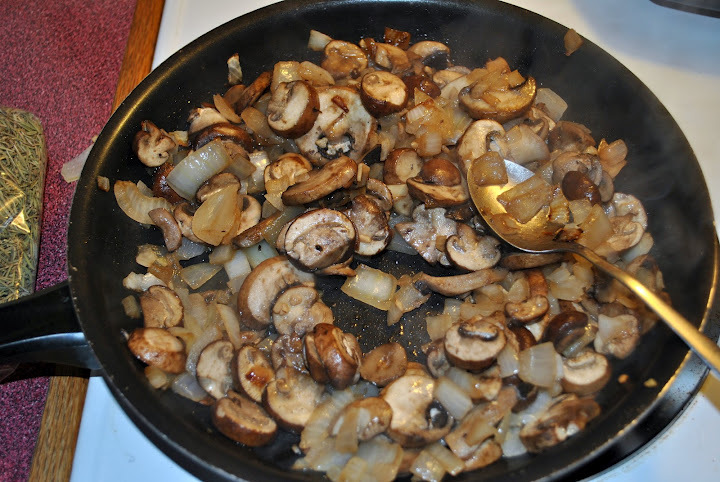 Add the onions and garlic and saute for about 5 minutes. 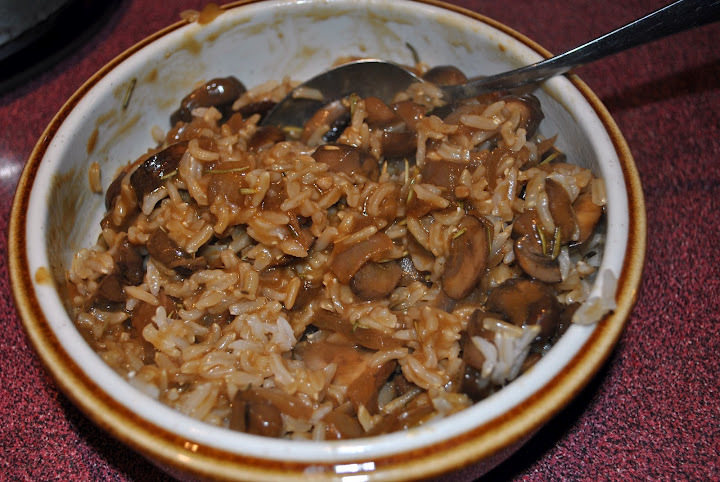 Add the mushrooms in and cook for 12 minutes. 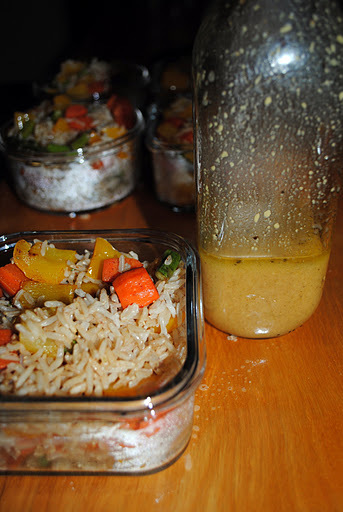 Now add the rosemary, nutritional yeast and tamari/soy sauce. Stir everything in and let that cook for one or two minutes. While that is cooking, mix together your veggie broth and cornstarch and whisk with a fork or small whisk until there are no clumps. 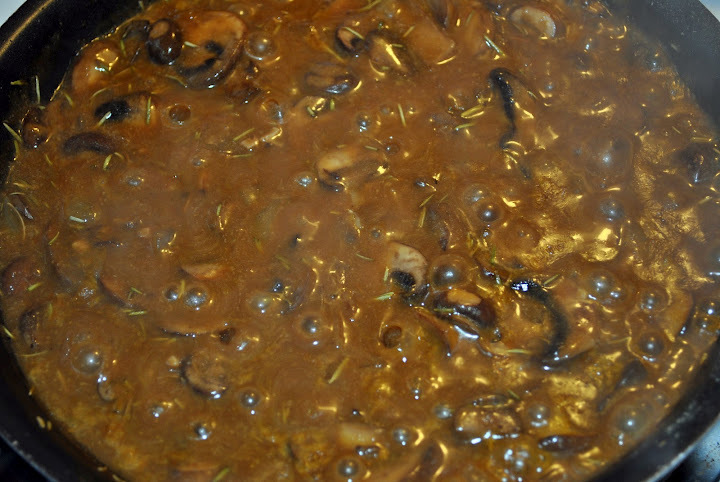 Add to the mushroom mixture, stir and let cook for another 5 minutes or so until the mixture has thickened to a gravy consistency. 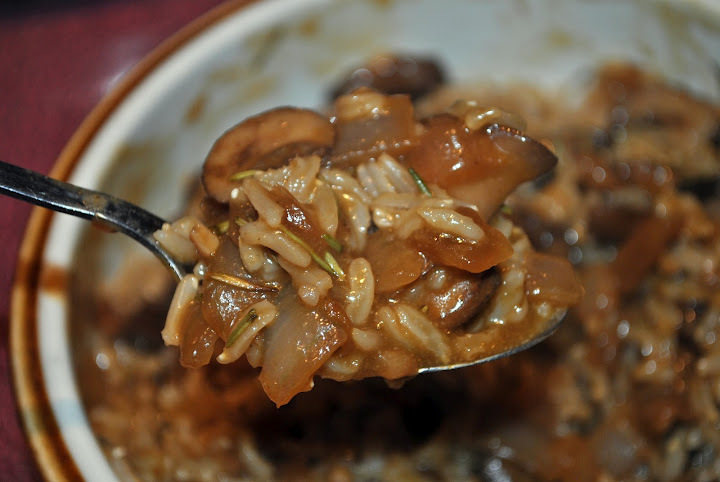 Spoon your finished rice into a bowl and top with gravy mixture. *My only complaint about this recipe was that the needles of rosemary really took away from the gravy consistency. I would suggest running a knife through the needles before adding them to the recipes or grinding them up. You could leave them out all together but they add a great flavor to the gravy. This recipe originally called for Kale and millet instead of rice but my super market didn’t have millet and I forgot my kale in my late night, night-before-I-leave packing. I imagine kale would be a great addition to this and will definitely add it next time I make it. 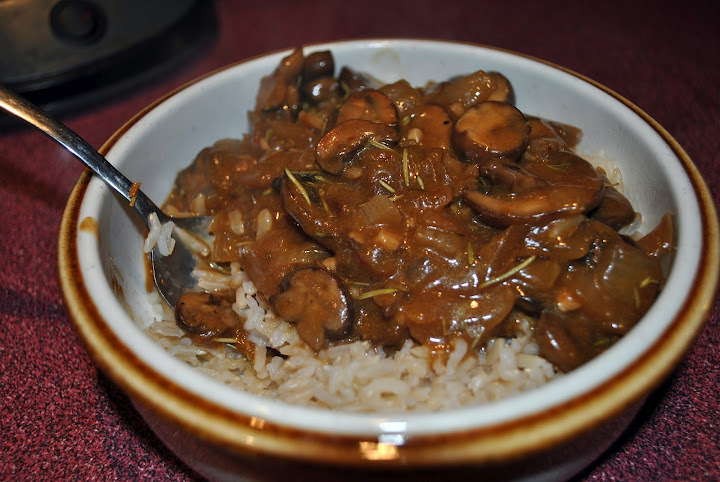 Even without it though, the mushroom gravy was delicious and hunkering down on the couch with a bowl full while watching movies was the perfect start to my vacation. Now…off to finish scrapbooking Day 1 of my Italy trip I took 2 years ago. I’ve managed to buy an excessive amount of condiments while here and even buy a purple polka dotted paring knife at an outlet kitchen store but I haven’t even made a dent in my scrapbook, which is why I’m here! Let’s see if I can remedy that today.